SolarReserve’s proposed Sandstone Solar Energy Project near Tonopah could be approved in a shorter period of time, as the Trump administration is looking to streamline energy development, but SolarReserve officials said that they are not going to rush the process. Courtesy of SolarReserve/file An artist rendering in 2016 shows SolarReserve's planned Sandstone project. Special to the Pahrump Valley Times SolarReserve already operates a 110-megawatt Crescent Dunes Solar Energy Project outside of Tonopah. The first utility-scale concentrating solar power plant began operating in September 2016. The Trump administration has implemented several administrative actions to streamline project review under the National Environmental Policy Act (NEPA), which apply to infrastructure projects such as Sandstone. Specifically, under Secretarial Order 3355, the Record of Decision for these projects must be published within 365 days of publication of the Notice of Intent. “This is bad for the environment, bad for our public lands and bad for developers. The future of renewable energy development on public lands hinges on the industry’s reputation and its ability to show the American public that it can build out responsibly,” Page said in an email statement. The National Environmental Policy Act is the law that requires federal agencies to go through a careful assessment before approving a project for permitting and construction, which includes conducting analysis of any potential significant environmental impacts, and consideration of different management alternatives and mitigation options, Page said. In 2017, SolarReserve proposed the 10-tower Sandstone Solar Energy Project near Tonopah which would be one of the world’s largest solar projects. The 2-gigawatt project is supposed to provide energy for 1 million Californians. Each tower will have approximately 10 hours of full-load energy storage and the total amount of energy storage capability for the entire project is 20,000 megawatt-hours. Mary Grikas, SolarReserve vice president of global communications, said that the company is not going to rush through the process. “Especially due to the project’s scale, we are not looking to rush Sandstone through the process. Rather, we want to be sure to have a rigorous and proper environmental review. Keep in mind we are in this business to protect the environment. We appreciate the BLM’s interest and efforts to streamline, but at the same time we recognize that this is a very large and complex project,” Grikas said in an email. Nye officials have been supportive of the project, that’s expected to bring thousands of jobs to the northern part of the county. According to the information posted on SolarReserve’s website, Sandstone will pay more than $100 million in salaries and operating costs per year and over $600 million in total tax revenues through the first 20 years of operation. The first phase of the construction is unlikely to start before 2020, at the earliest, but when it does, it will create about 3,000 jobs that will last about seven years, Grikas said. “We have a lot to do before breaking ground. Permitting and obtaining a power purchase agreement (PPA) are both significant steps. We also need to ensure that the project will have access to transmission,” Grikas said. Meanwhile, some conservation groups are voicing concerns over the project’s impact on desert wildlife. Kevin Emmerich, a co-founder of the Basin and Range Watch, a non-profit that seeks to conserve deserts in Nevada and California, echoed other environmentalists’ concerns about potential shortening of the environmental review. “Shortening the environmental review to just one year will ensure that important details are missed and may result in the approval of a project that has significant wildlife impacts which can’t be mitigated,” Emmerich said. Emmerich said that building eight towers would create a very intense glare that would be visible from over a dozen mountain ranges. “Like the Crescent Dunes tower, these (towers) would also burn and vaporize birds through radiant solar flux. Filling up the Big Smoky Valley with 8 more of these towers could eliminate a significant percentage of the avian fauna in the region,” Emmerich said. Grikas said that SolarReserve is committed to minimizing the impact of its project footprint, an approach which starts with a rigorous site selection process including a close examination of the potential critical flaws of a site. “We certainly subscribe to the BLM’s ‘smart from the start’ approach. Such considerations include plant and animal habitat, water consumption, streambed alteration and floodplains, traffic, air travel, military operations, and last but not least socioeconomics,” Grikas said in an email. SolarReserve already operates a 110-megawatt Crescent Dunes Solar Energy Project outside of Tonopah. The first utility-scale concentrating solar power plant began operating in September 2016. 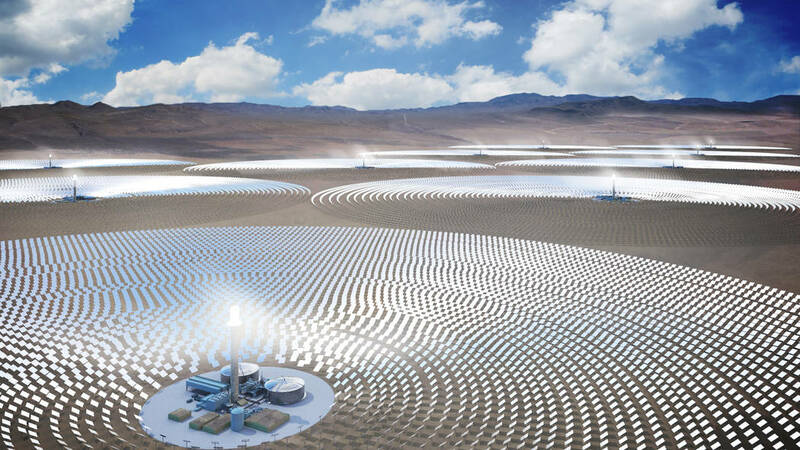 Sandstone’s location in remote Nevada’s desert near Crescent Dunes was chosen to minimize environmental impacts, based on SolarReserve’s experience in the region, Grikas said. “We expect the impacts to be low based on our experience at Crescent Dunes and on preliminary analyses we’ve done in-house. It’s also a much lower impact to build several towers in a single location, with shared facilities, access roads, transmission, administration, construction laydown, etc., than separate projects with their own repeated infrastructure across the desert,” Grikas said. SolarReserve said that monitoring by independent environmental biologists over the last two years has proven the Crescent Dunes facility as one of the safest forms of electricity generation, especially for bird safety, with an average of about five bird fatalities reported per month at the facility – dramatically less than other forms of electricity generation, including natural gas, nuclear, coal and wind energy. “The number of bird mortalities has been confirmed by several different teams of on-site independent environmental consultants, who report their findings directly to the U.S. Bureau of Land Management, U.S. Fish and Wildlife Service, and Nevada Department of Wildlife. The fatalities were largely due to bird collisions with buildings, transmission lines and equipment related to the project,” the company said on its website. But some are still concerned that Sandstone will cause avian fatalities, as the project will include thousands of heliostats that collect and direct the sun’s thermal energy to heat molten salt flowing through solar power towers. In 2015, Crescent Dunes Solar Energy Project conducted preliminary tests that involved aiming 3,000 mirrors, called heliostats, at standby points above the receiver, Page said. “The exercise killed 115 birds that flew through the concentrated flux. 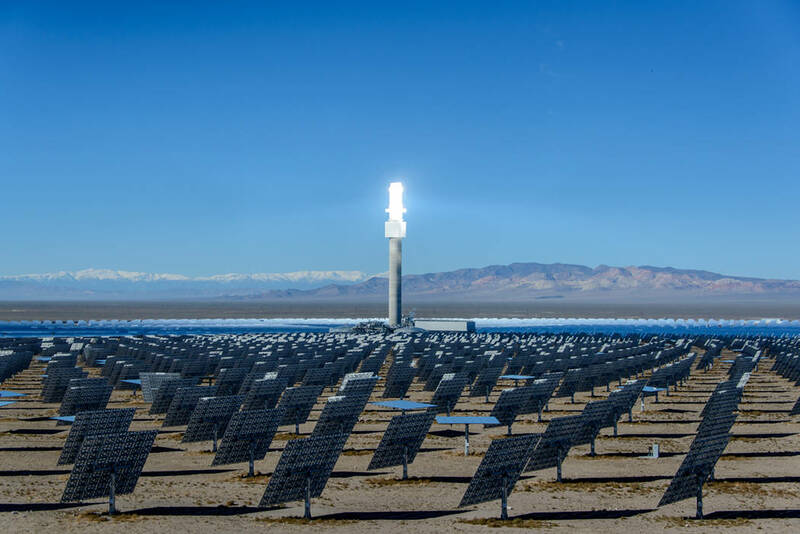 SolarReserve decided to spread the standby aim points over several hundred meters to reduce the peak flux to less than 4 kW/m2 (4 suns),” Page said. In addition, Page said that the area where the project is proposed to be constructed is a wildlife corridor for pronghorn and for mule deer, which is identified as a Species of Greatest Conservation Need in Nevada. Developing this area could conflict with Secretarial Order 3362, which directs federal agencies to conserve wildlife corridors for these species, she said. The proposed site for Sandstone is about 20,000 acres of federal land managed by the Bureau of Land Management between Las Vegas and Reno. BLM officials released few details on the project’s status. BLM Battle Mountain District which oversees the area where the proposed project would be built said there has been no update. “The project remains in the planning phase and, at this time, the BLM does not have an update on the project,” said Kyle Hendrix, public affairs officer for the BLM Battle Mountain District. Requests for comment directed to other BLM officers were not returned.